The PackH2O Water Backpack took home the 2013 People’s Design Award at the National Design Awards gala in New York, Thursday, Oct. 17. 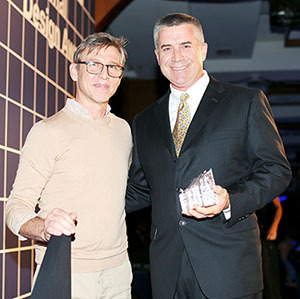 Todd Oldham announced the winning design and presented the award to president and CEO of Grief Inc. David Fischer. PackH2O attempts to solve the global clean water crisis by giving people the power to easily transport their own water. The PackH2O Water Backpack was designed by Greif Inc. to provide a cleaner, safer alternative to the often contaminated jerry cans and buckets used in developing countries to transport water from source to home. The backpack features an ergonomic, gender-neutral design, adjustable shoulder straps and a removable liner that can be sanitized in the sun. PackH2O has distributed more than 100,000 packs across five continents through collaborations with companies such as Habitat for Humanity and Partners for Care. This year’s contest, organized by the Smithsonian’s Cooper-Hewitt, National Design Museum and Smithsonian magazine, invited the public to vote for their favorite design from a pool of 20 works that emphasizes how innovative design makes a difference in our everyday lives. Voting took place from Sept. 10 through Oct. 11. Nominees ranged from transportation solutions (Helios Bars, HelmetHub and Sunset Skateboards), designs for healthy living (Misfit Shine), educational products (littleBits), interactive design (Dot Dot Dot, Double, Journey, Leap Motion controller, Mailbox and Medium) and landscape design (Nature Gardens at the Natural History Museum of Los Angeles County and Spring Street Park, Los Angeles), to medical devices (EvoCam by Evotech and Hamilton-T1 Ventilator), emergency preparedness tools (Etón BoostTurbine 4000 and SpareOne plus phone) and examples of socially responsible design (Tiny House grown with Ecovative’s Mushroom Insulation, PackH2O Water Backpack, and Protein Pods and a New Coat of Paint). The People’s Design Award is part of Cooper-Hewitt’s largest public education initiative, National Design Week, Oct. 12-Oct. 20. Previous winners of the People’s Design Award include Marianne Cusato, designer of the Katrina Cottage, Toms Shoes, the Zōn Hearing Aid, the Trek Lime Bicycle, the Braille Alphabet Bracelet and Design Matters, a show about design and culture.